Videos captured by fans on cellphones and personal cameras have also been trickling onto YouTube this morning. “Violence will not be tolerated in either of our stadiums. The incidents at Candlestick Park last night after the San Francisco 49ers versus Oakland Raiders game are completely unacceptable and will be prosecuted to the fullest extent of the law. 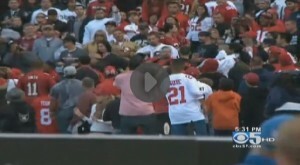 Fans come to our stadiums to enjoy an afternoon of football, not to be subjected to intimidation or violence. These games are family events and the types of images we witnessed last night have no place in our arenas. Public safety remains our top priority and we are doing everything we can to ensure that when fans come to our cities and our sports arenas they have a positive, safe and enjoyable experience. Prior to the game, Lee and Quan played up the long-standing rivalry with a bit of humor. The two made a friendly wager on the game: the winning side would receive a care package of the losing side's best edibles.